All of Wallside's double hung windows installed after March 14, 2016 feature FlexScreen - the world's first flexible window screen! Here are helpful videos that will guide you though how to use screens on our newest windows and our older versions. 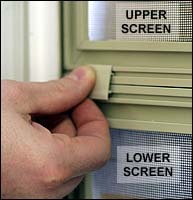 Screens are held in window frames with hidden spring clips on left side, when viewed from inside home, or right side, when viewed from outside home. Some windows with two half-screens have screen clips which must be removed before either screen can be removed. Replace these clips after replacing screens. 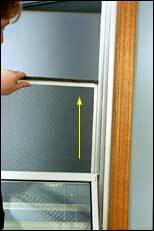 Remove aluminum screens from inside your home. If a window has two screens, remove the top screen first. Grasp lower right screen ridge with fingers. Push/pull screen left (to compress hidden spring clips on left side of screen) and push corner out away from you. Push/pull screen down, to the right, away from you, and out of frame. Slide screen up to clear bottom track. Grasp top of screen, push left (to compress hidden spring clips on left side of screen) and out away from you. Push/pull screen out of frame. 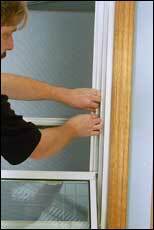 Replace aluminum screens from outside your home. Insert lower right corner slightly into right track. Angle top right corner into top track. Slide top right corner clockwise into place. With one hand, push screen to right (compressing spring clips into right track) while tapping top left corner of screen into top track with other fist. Press left edge in while firmly tapping in lower left corner with fist.